This cake is simple to make and delicious to eat. No fancy arrangement and all the pears are dumped into the batter. Generous and every bite is deemed to have some pear. You won’t feel the textural difference as the pears were soft after baking and yum yum.. delish! The cake is basically sweetened with pears and not sugar. I used only 50gm of sugar here and way lot more of pears. For the pear pound cake gratin, Lyanne didn't really see the pears when they were camouflaged by the chocolate drizzle, and just walloped up everything. But for this cake, it is visible.She saw them there, wanted to pick them out, but I didn't let her. I managed to force my baked fruit hater to eat the pears in it as well. The method was, I didn't let her hold her cake, but fed her with it. Either she eats or don't eat at all. But she chose to eat it because she really loved it. Usual cases when I force her to eat something she's just ok with, she'll choose to go away. 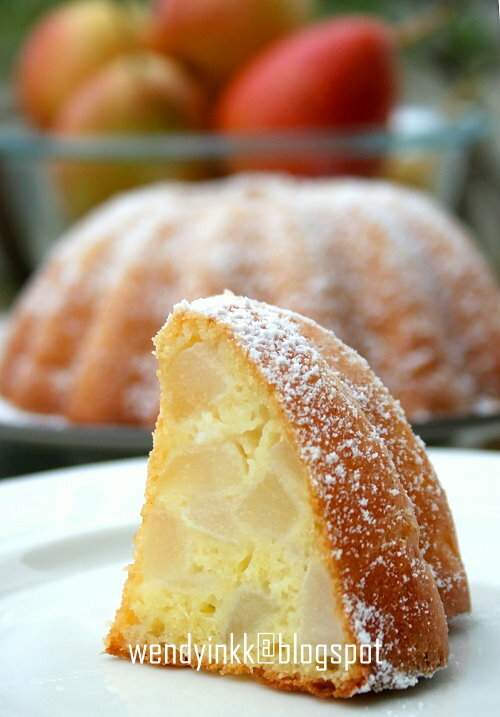 Now if you have some not to nice to eat pears, throw them into this cake. It’ll be nice to eat. My pears aren’t soft mushy mushy, but still firm, not too firm, maybe.. hmm…. Just nice. I bought them about 1 month ago and never got around doing something with them, and luckily these Forelles were still ok after all that time. Anjou on the other hand, or crimson pears won’t last that long in the fridge and will turn mushy mushy. But still you can use those really soft pears in this, just throw in 1-2 more Tbsp of flour. I used Forelles for this cake, and the original recipe calls for Anjou. Anjous are not found or seen at this time and they are indeed more buttery. 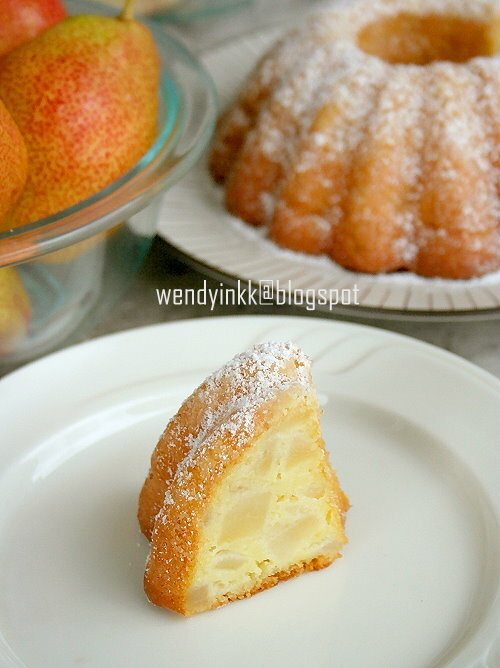 Hehehe, the original name for this cake is Anjou Pear Cake, but since I didn't use Anjou, I better remove that word to avoid confusion. Oh yes, I do find some liquor jazzes up the cake.. errr pears. Omit it for religious or allergic reasons, but if not, I urge you, try not to. 3. Juice lemon, mix with rum and set aside. 4. Peel, core and dice pears. Mix with lemon rum mixture. Toss to coat. 5. Sift flour + baking powder into a bowl. Mix with sugar. 6. Mix butter with eggs and pour into (5), gently stir to combine. 7. Pour in pears and all the liquid in the bowl into the batter. 8. Fold everything and pour into prepared baking pan. 9. Bake for 45-50 minutes. 10. Remove from pan and dust with icing sugar and serve. 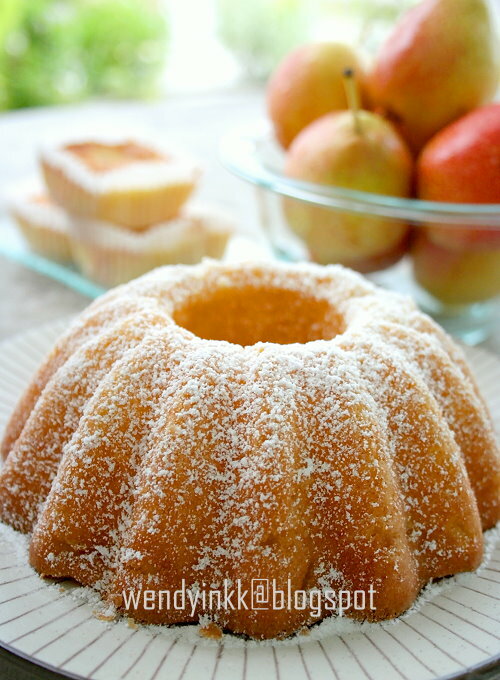 *I used a small bundt pan(650ml capacity) and had some extra batter enough for 3 small cuppies. You can use a 1L capacity loaf pan if you wish. Wishing my beautiful country Malaysia a wonderful 55th birthday. May Peace and Love fill our countrymen. Wow, another beautiful cake! It looks so moist and delicious. The pieces of pear just melt in your mouth I'd bet. A glance at it already knew it is a delicious moist cake. Beautiful baked in this bundt pan. Hi! Will the taste be very different if I don't use any liquer or rum? The amount of pear quit a lot compare to flour portion which I like. Do you think go well with apple? Maybe use the one 'not so fresh'? This cake looks very gorgeous. I would love to try and bake this. love how pretty this looks and the chunks of pears! it looks so pretty and yummy I can't believe it's reallyt hat easy! I love that you left big chunks of pears in it! My pears are not cold, because I took them out few hours earlier, never use cold things to bake cakes unless specified. Use a sharp knife to get clean cuts. Minor difference, but it's a nice minor difference. Just less fragrant, minor only. If u haven't been using any liquor in bakes, you might not notice the difference. Grand Marnier sounds good too. I love your pear cake. It looks nice in that shape. Must be very delicious and wish I could have a piece of that ha!ha!ha! all purpose flour can be replaced by any wheat flour ??? all purpose flour is made from wheat and I'm not sure of the other wheat flours that u mean. Pears and oranges are not tropical fruits. 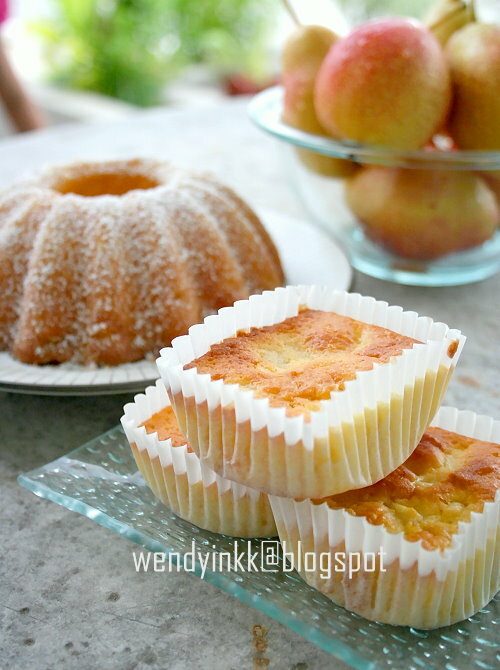 Actually I rarely use tropical fruits like papaya, guava, durian or mangosteen to bake. can I use other pan instead of bundt pan? I did make a note in the post that one can use a loaf pan if wanted. i have a problem with this recipe :/ i made the cake like the instruction but the cake was too soggy and i don't know why. do you think i can reduce the amount of pears or can you tell me how i can fix the problem? :( I'm so sad about the result. pls help. Did you wash the pear cubes? What type of pears did you use? ehm...i did'nt wash the pear cubes. after i sliced the pears i just mix it with the lemon juice (i didn't use rum cuz i do not really like alcohol). i just use william christ or some sort of that. can you tell me how the pears should be? my pears were still firm, sweet and juicy. Williams should be fine to use. The recipe did call for ripe pears, so, your pears should be alright. I hope you weighed the pears before peeling, not after slicing/dicing. May I know what pan size did you use and how long did you bake it? The original recipe from BBC GoodFood baked it in one pan and baking time was 50 minutes. thanks for your rapid answer :) i weighed the pears before peeling and so on. i used a 7 inch springform pan and baked everything for 50 min. tomorrow i will try it again and then i will tell you the result. maybe our oven wasn'nt hot enough. 7 inch could make the cake too thick and hence,you may need more than 50 minutes. Tall cakes retain moisture during baking much better too. So, using a wider pan could solve your problem. the instruction at step 2 is for a springform pan.